Tooth enamel is the first line of defense your teeth have against plaque and cavities. It is the white, visible part of the tooth and it is also the hardest part of the human body. Unfortunately, tooth enamel takes a lot of abuse from the acids formed by cavity-causing bacteria. So how can you protect your child’s tooth enamel? Sugar feeds the bacteria on your teeth, causing plaque and ultimately cavities, which is why you should limit the number of sugary foods and drinks your child consumes. Before buying your children snacks, check the back of the package for the amount of sugar contained in the snack. Try to avoid sugary drinks like soda, fruit juice and sports drinks, all of which are notoriously high in sugar. Calcium is a dental super mineral. That’s because it neutralizes damaging acids and is a great enamel protector. 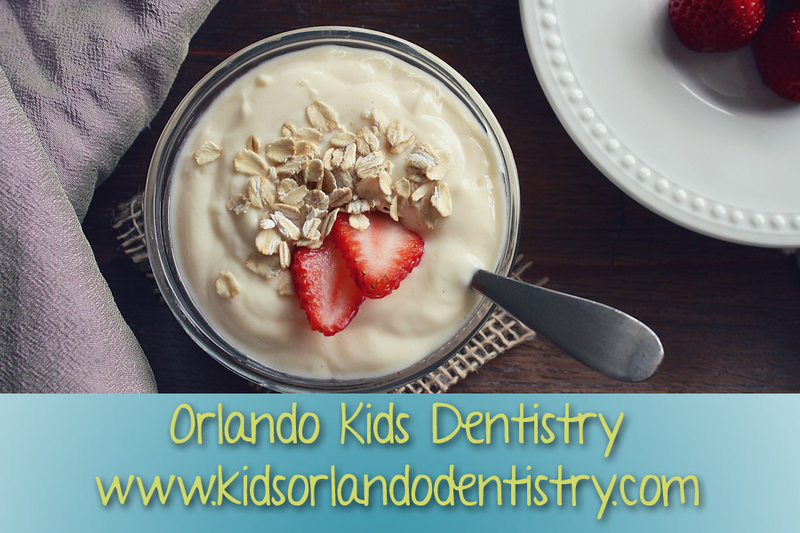 Try to add at least one dairy product to each of your child’s meals to provide them with adequate amount of calcium. If your child does not consume dairy, try giving her some of these other calcium-rich foods: almond milk, canned fish, kale, soy yogurt or soy beans. If you’re buying packaged food as a calcium source, check the packaging to ensure that there is an adequate amount for your child. Food debris left on your child’s teeth encourages bacteria growth that eats away at enamel and causes cavities. This is why it is important to brush twice per day, for two minutes at a time, and floss once per day to clean debris from the hard-to-reach areas of your child’s teeth. If your child is unable to floss by themselves, then floss their teeth for them. Brushing and flossing your child’s teeth are a great way to keep their mouths debris-free and fight plaque buildup. A great way to remove food debris from your child’s mouth is by having them rinse immediately after meals. Have your child swish clean water in their mouth for 30 seconds, and then spit it out in a sink. Encourage them to do this after each meal to keep their mouth clean and healthy. Food and drinks high in citric acid erode tooth enamel in a process called demineralization. In bad cases of demineralization, acid will work its way to the soft layer beneath the enamel called the dentin. These advanced cases lead to tooth sensitivity and pain. If you consume anything with high citric acid, rinse with water for 30 seconds afterwards to clean away some of the lingering acid. Toothpaste with fluoride strengthens enamel through a process called remineralization. When choosing fluoridated toothpaste for your child, make sure that it has the ADA seal of approval to ensure that it has been rigorously tested and approved. Visit our office so that we can evaluate your child’s overall oral health. We check and document the state of your child’s tooth enamel as a part of our regular checkups, and we will help give you and your child the knowledge necessary to keep a healthy, lifelong smile.